LOS ANGELES, Calif. – Oct. 17, 2016 – SmartFlow Compliance Solutions (SCS), a leading software anti-piracy and cyber security company, announces SmartFlow Professional 2017, the latest release of its entry-level, cloud-based anti-piracy solution for small and medium-sized businesses (SMBs) developing software and intellectual property (IP). SmartFlow Professional provides SMBs with an affordable solution for developing or expanding their compliance management and IP protection efforts. SmartFlow Professional helps businesses combat the global issue of unlicensed software usage and IP theft by identifying unlicensed versions of software and tracking actionable usage data that can be leveraged for negotiation or legal action against IP theft and copyright infringement. The new release of SmartFlow Professional is subscription-based software as a service (SaaS) hosted online by SCS through the secure Amazon Web Services (AWS) platform. The software uses a simplified version of the SmartFlow software development kit (SDK) that can be easily integrated into most software applications running on Microsoft Windows, Mac OS X , or Linux platforms. 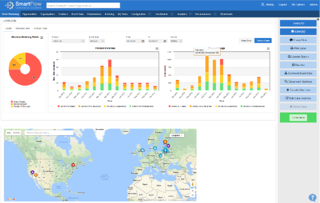 Standard features include SmartFlow Insights, a tool for data enrichment, and Wi-Fi geolocation, which provides detailed information on the location of unlicensed users. SmartFlow Professional is an entry-level version of SmartFlow Enterprise 2017, the company’s flagship product for large companies that want to start or already have an in-house compliance program. SmartFlow Enterprise provides added capabilities such as configurable data collection for compliance with the upcoming European General Data Protection Regulation (GDPR), SmartFlow Analytics for business intelligence and custom reporting, and an open application programming interface (API) and integration with Salesforce.com. SmartFlow Professional 2017 is available immediately and is licensed on an annual subscription basis, starting at $12,500. For detailed pricing or more information, contact info@smartflowcompliance.com. SmartFlow Compliance Solutions (SCS) was created to help software vendors combat piracy and under compliance with automated tools that minimize the resources needed to identify software abuse and to generate revenue recovery & sales. Over a decade in development, the company’s innovative SmartFlow identification and analysis software represents the best practices of license compliance programs within the world’s leading companies, providing clients with insight on how incompliance and piracy are affecting their business, customers and profits. SmartFlow Professional, SmartFlow Enterprise, SmartFlow SDK and SmartFlowCQ are trademarks of SmartFlow Compliance Solutions, Ltd. All other trademarks are the rights of their owners.